After Josef Jakobs was executed on 15 August, 1941, his post mortem was conducted by two men: London Eastern District Coroner W.R.H. Heddy and renowned pathologist Sir Bernard Spilsbury. Both men likely took meticulous notes but trying to track those notes down has proved to be a wild goose chase. 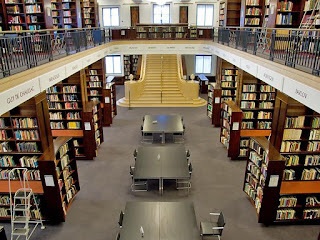 In 2008 and 2009, a portion of Spilsbury's case notes, which he had transcribed onto index cards, were acquired by the Wellcome Library in London. The library is "one of the world's major resources for the study of medical history... and offer a growing collection of material relating to contemporary medicine and biomedical science in society". 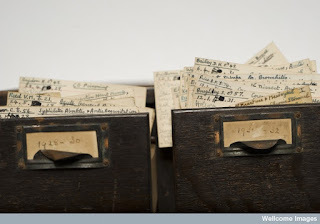 The index cards, about 7000 in total, contain just a fraction of Spilsbury's case notes. There are some temporal gaps but... it was worth a shot. In 2012, I visited the Wellcome Library in the hopes that the case notes might include an index card on Josef's post mortem. The cards were slightly more organized than when the Wellcome Library acquired them. There were 25 boxes of index cards, arranged by date. In reviewing the August 1941 index cards, I came across the cards for Werner Walti and Karl Theodore Druecke, two spies who were hanged at Wandsworth Prison on August 6, 1941. There was, however, no card on Josef Jakobs. This may be due to the fact that his execution was shrouded in secrecy. The other option was case notes by Eastern District coroner W.R.H. Heddy. Those notes were not, however, held by the Wellcome Library, but by the London Metropolitan Archives. Coming up in the next post.